Hold On, Hold On, Let Me Get The Words Out Before I Burst. Shout Out, Shout Out, This Silence Only Eats Us From The Inside Up. Give Me Time, And Give Me Space. Give Me Real, Don't Give Me Fake. Give Me Strength and Self Control. Give Me Heart and Give Me Soul. On March 15, 2012, I updated my Facebook status. This is noteworthy for two reasons. So, I update mine about once a year. Little did I know that this question would create a great debate among the students on our trip and would be by far the most commented upon thing ever to appear on my Facebook. It was fantastic. People gots serious. This turned into a full-scale debate. Despite the excellent responses, and the less-than-excellent ones, I still didn't feel at peace. I would still freeze up during that pivotal parenting moment. I couldn't decide. Quickly subject my kids to Jar Jar Binks and the Clone Wars before they could completely understand the butchery, or risk them losing interest in 45 year old special effects. I was doomed to spend the rest of the nights in that dorm room restlessly tossing and turning; unsure of my to-be-parenting-skills. A light from Bespin came beaming down in the form of novelty... and magazine print. I opened this month's issue of Wired and gasped aloud! They had tackled my Lucas-inspired dilemma. Wired wrote up an article describing their perfect viewing order. It maintains the integrity of the original series AND allows for integration of the prequels. See that? I have friends who are months ahead of professional journalists. 1. It will be absolutely fascinating to see where the profession of journalism will be in 10, 15, and 20 years. 2. Social media is the new way in which news is broken. People will find out about worldwide events because of their own personal accounts - not because of news anchors or paper writers. Which is incredible - and kind of scary. People will increasingly become aware of world events - a sorely needed quality. But more and more of the world will get their news in silos. People will simply filter out anything they don't like. The legacy of 24 hour news networks will be that people will be able to dismiss sources as irrelevant just because they have a different narrative of every story. 3. Star Wars is awesome. During the year of its 35th anniversary, this series is still creating and fueling debates. Most importantly, these movies are gaining new fans in every generation. Even now, in this generation, which will be the first without a Star Wars movie in theaters (if you count the Special Edition screenings). That is simply stunning. I don't usually write about politics and religion on the internet. Because the intersection of the two topics is a quagmire section of the information superhighway frequented by those who want to shout their opinions and those who want to read their own opinions written by other people. It's most frustrating because authors continually posit themselves as experts in fields in which they have no formal training. I am all for voicing one's opinion, especially if that is a deeply-held conviction or moral. But what we're often shown are ill-constructed, poorly-written articles disguised with political jargon, semi-academic wording, or religious underpinnings ripped from their contexts. Finding articles that espouse a well-thought-out, researched, and logical argument regarding the cross-roads of politics and religion is... well... difficult. However, when Rachel Held Evans' How to win a Culture War and Lose a Generation was pointed out to me, I had to take note. Evans' article has caused all sort of backlash. From scathing criticism, to not-so-scathing criticism, to criticism veiled as rising above itself. To be frank, these articles all miss the point. Andrew Haines' "Integral Ethics: Why 'Social Issues' are the Only Sort that Matter" is a case study in problematic internet expertise (despite the fact that he's getting said formal training). While Haines tries to hide behind his verbosity, his inability to see how contradictory his statements are (see: cognitive dissonance) isn't lost on John "Fitz" Fitzgerald, who rightly calls Haines on the carpet. The problem that all three response articles suffer from is that they all speak as though they represent the entirety of Christianity. They pretend that there is one voice on the issue of LGBT rights with which every sect of Christianity agrees. I know quite a few Episcopalians and Anglicans who would take issue with this idea. Which leaves Haines et al with the uneasy prospect of declaring other Christians to be not just wrongly convinced on an issue, but unChristian altogether. Fitzgerald sees this, and his closing paragraphs nail it. The flip-side of this problem is what Evans gets right. She doesn't once state that she's speaking on behalf of one denominational sect of Christianity, let alone the whole of the Christian world. Evans is voicing what her (and my) generation are saying. The evangelical youth are surprisingly vocal about LGBT issues - and they're speaking out in contrast to what they're parents' generation is saying. "As an aside: where on earth is Evans meeting young Christians that 'all' of them say these sorts of things?" While every single one might not be saying this, I know exactly where Evans is meeting these young Christians. She's meeting them on the campuses of the top Christian colleges across America. She's meeting them here, and here, and here, and here. And those are just four examples of a growing list of LGBT organizations at Christian colleges, which are gaining courage to speak, and momentum with their peers. Even if we take David Sessions' smart advice to question the idea of "Culture Wars", and eliminate the idea of this being a culture war from our thinking, we are left with something monumental. We are left with a striking generational shift. We are left with, as Evans puts it "Christians over 40...celebrating. Christians under 40...mourning" when political happenings such as Amendment One occur. This generational shift has immense potential. Potential to either reform Evangelical Protestant America, or potential to rip the American church in two - cleft right down the generational tectonic fault line. Sessions is right - Christians should ditch the culture war paradigm. But before Christians begin to talk about some sort of "united stance" on LGBT issues, Generations V and W should figure out how they are going to deal with Generations X and Y. Because pretending like there is one solid and universal Christian view on this topic is farcical. It is no longer acceptable - in fact, it's no longer the norm - for Christian communities to suggest that Christians feel one way about LGBT rights. It should never have been acceptable for Christianity to become equated with "anti-homosexuality" to the vast majority of American youth (as quoted by Evans). This stereotype, and the reality it is based in, need to change. It's shaping up to look like young Christians want to change this stereotype. The question now is whether this generational shift will become accepted and embraced by "Christians over 40", or whether that generational fault line will start cracking. And so, for the first time in over four months, the post will originate from the left side of the Atlantic. What a trip it was. What a time. I've only faced it a few times, but when I'm asked, I revert to the tried-and-true: "It was fantastic." It's strange, I wasn't expecting to be unable to describe my 2012 like this. I've gone through "re-entry", I've done this before. Besides, it'll be easier for me to recount my trip because I was partially leading it. It's more difficult for me to describe all this than 2009 was. Meh. You see, that's not a big deal. Why? Because I'm home. Entering the US again was like exhaling the largest sigh that your lungs are capable of holding. It was as though weight was being sloughed off my shoulders with every step. It's not that I disliked what I had done, or felt burdened by it at all. It was just time to come home. Man is only capable of living out of a backpack for so long. Keep breathing, that's the key. After spending ten days in the Old City of Jerusalem - exploring its nooks, ancient and religious spots, and shops - we returned to our lodging in Bethlehem. What is there to say about Jerusalem? The city is an enigma. There is certainly no place on earth even remotely like it. "What's a typical Jerusalemite like?" I'm not sure there is such a thing as a typical Jerusalemite. They one thing that I can say is that people here are convicted. Religion runs thick in the blood of the people, and leaves its marks on walls. The three monoliths of monotheism stand tall here. So tall, in fact, it's nearly impossible to escape their shadow. Most of the time, it's refreshing. There is nothing like being immersed in piety to jumpstart your own beliefs. Not to mention putting a landscape, a scene, or a picture to the stories. Jerusalem syndrome is a very real thing, indeed. Some of the time, though, Jerusalem is suffocating. Some of the time, the enveloping is all-encompassing, and this religious Adventureland is just too much. In a word, the city is overwhelming. I am convinced that people need twice the amount of time afterwards to processa and comprehend what they experienced in the city. All that said, there is some extreme beauty here: the smells are amazing, the sounds mesmerizing, and if you aren't pushed to tears at the majesty of the tombs or the Dome of the Rock, then you need to check your pulse. After those ten days, we spent a three-day whirlwind back in Bethlehem... and then, it ended. Wow. What a trip. When looking back, I have an incredibly warped sense of time. It feels like ages ago that I boarded my flight to IST via LDN - but really, that was only four month. Four incredible, jam packed, solid, challenging, eye-opening, exhilarating, life-altering, paradigm-shifting, lovely, amazing months. A bitter end? Maybe, but there's sweetness in the mix. These next 7 days will be filled with joy, as my mother has come to Israel/Palestine. Her presence is so very welcome. I have been eagerly anticipating this day, and it is immeasurably good to have a tangible, breathing, loving piece of home here. La Seigneur est très bien, mes amis, vraiment très bien. Keaton Hudson is a wonderful photographer. He's been documenting the entire trip, and doing a great job. Keats, thanks for the new profile pic. 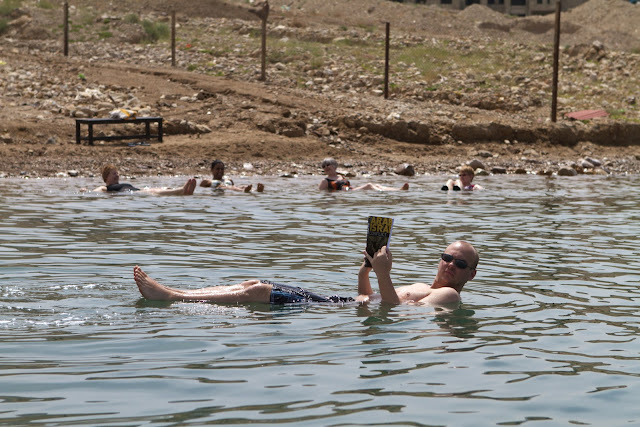 Just floating in the Dead Sea. Here's an excerpt from the official blog that I am keeping for the Westmont in Istanbul program. Please ignore the bit about me being home in 10 days, that ain't true. These five days were a welcome change of pace as we entered our last country. We settled into our digs at the Tantour Ecumenical Center, and began looking at the incredible land around us. About twice a day, students would pass through Bethlehem checkpoint to enter the city itself. Some of the time was spent looking at the current Israeli-Palestinian conflict and the marks it has/is still leaving on Bethlehem; and part of the time was spent visiting some of the historical and traditional sites of Christianity. We snuck into Jerusalem for a remarkable day on Friday, April 13. Eastern Orthodox Good Friday coincided with the last day of Passover this year, and the amazing city of Jerusalem bustled with excitement. We managed to successfully maneuver through the winding streets - and even into the Church of the Holy Sepluchre in the middle of a procession - and come out the other side full of unforgettable stories. We spent an amazing day and a half up in the Galilee. Visiting Campernaum, we were able to walk in the ruins of a synagogue similar to the one that Jesus would have preached in. Floating on the Sea of Galilee, we felt winds like those that Jesus' words quelled. Upon the Mount of the Beatitudes, we reminisced on the incredible words of the Sermon on the Mount. The next day, we were honored to hear from Archbishop Elias Chacour, a Palestinian Christian who preaches a message of reconciliation based around the events of his own astounding life. The past three days have been a blur of site visits (the Western Wall, Garden Tomb, city rooftops, Southern Steps, etc. ), street-side interactions, lectures (on topics like Jewish history and sects, Christian Zionism, and the Jewish roots of Christianity), and religious ceremonies (churches and synagogues). Heck of a way to end the semester, eh? Parents, family, and friends - we'll be home in 10 days... Are you ready? Stress. I felt a lot of stress. The plan for the day had been laid out and I was supposed to be responsible for 5 college students as they walked around a city I don't know on one of the busiest days of the year. We got on the number 24 bus just outside of the Bethlehem checkpoint. I just needed to pray and clear my head. When we arrived at Jaffa Gate, I collected our team and smiled - it was gonna be fine. We were gonna enjoy every bit of today, no matter where we ended up and how long it took us to get there. So, I took a big breath and walked through the threshold of Earth's holiest city: Jerusalem. I had no idea that the old city is basically just a giant bazaar, but found out quickly as the small shops continued to go on for the entire street until I stumbled almost headlong into the sign that said Western Wall. We walked down the steps and I reveled at the place. What majesty was here. It is an incredible testament to the buildings that once laid on this foundation. You see, today was particularly special, as it is the last day of Passover. There was a large group of orthodox Jews gathered in front of the last remaining piece of Soloman's great temple. I found myself in the middle of said crowd who were all reading, bobbing, shaking hands, smiling, praying, and worshiping. There is a sort of sublime surrealism to the place. Western Wall below and Dome of the Rock above. After trying to process just where I was, we turned and headed North. Our plan was to park somewhere along the Via Dolorosa and people watch. This didn't really happen. We found our way to the Via, but it was blocked off by Israeli Defense Force officers. So, we tried another road. Fortunately, this one was open. However, it was a tiny little alleyway absolutely swarming with people, crosses, incense, and singing. You see, today was particularly special, as it is Orthodox Good Friday. There was a large group of Orthodox Christians processing down the road over which Jesus' carried his cross. We were planning on just watching, but got sucked into the stream of people and before we knew it were lead directly into the church of the Holy Sepluchre. I can honestly say I have never experienced anything like this before. It was a flash-bang grenade of sights, songs, scents, and spirits. The church is so beautiful - and so complex and fought over - it hurts. I need to go back so that I can actually experience the place. The Dome of the Church of the Holy Sepluchre. Then we headed out of the city as we were going to go to the Mount of Olives. We didn't quite make it the way we had planned. We happened to be leaving the city right at the wrong time. We tried to make it through the Lion's Gate at the same time as hundreds of Muslims who had just finished praying. You see, today was particularly special, it's Friday, the Islamic holy day, and Muslims use this day to go pray at the Al-Aqsa mosque atop the Temple Mount. We were pressed up against a crowd of men, prayer rugs in hand, all leaving the Old City to return to their families. What should have taken us a minute took a half hour as the crowd bottle-necked out of the city. But frankly, I didn't mind. I was in awe of it all. I later realized that in the span of one day, I was completely surrounded at three different times by Jews, Christians, and Muslims in the middle of their pilgrimages. Now that puts this city in perspective. The pain never felt so good.